I chose him as I read good reviews about him. Thanks It was my understanding that all of the thinning area would be targeted I sent on that very photo to the surgeon when I got home. He said that he didn't do it as it would compromise the donor area this was never discussed in my consultation I was told 2000 grafts were enough clearly there were not. I was told I got 2000 who knows how can you actually validate this you are at the mercy of a surgeon and his honesty. Hi Raphael84, I am 42. I take your point on board about getting good photos so expectations are realistic makes total sense.I flew to Poland for a 1 on 1 consultation as I thought this would be of great benefit as the surgeon could assess the situation rather than relying on photos and give myself the best possible chance of a good result. I am attaching a photo of the area covered 2000 FUT. Assuming I get another 1 I will meet 1 on 1 for a consultation. If you have any highly recommended fue surgeons please share I'd appreciate it. Photo taken today quality not great but best I can do. Please see attached photos the second photo was the morning of my procedure the first photo was taken a few weeks ago. Hi lasercap, I first contacted him In July 2017 I sent on some pics not great quality from my phone. He responded very promptly and said looking at the photos I sent I would need 2000 grafts but in order to get a more accurate idea he asked me if I could go for a consultation. 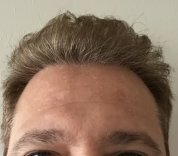 I flew over to Poland in Oct 2017 and had my consultation met him and his staff and I clearly called out that I wanted the thinning area filled in and if the hairline could be improved slightly also. The graft count still was 2000 so at this point I felt re assured as I met him one on one seen the surgery and had a good feel about the place at no point did he say it would need more grafts or another procedure. I started using CR lab green and purple lines and laser band on his advice pre op and post op.I had the procedure 19th March 2018. When I got home I seen he had not tackled all the thinning area and I challenged him on this this was only a month post op and he said it was early days give it time etc but a year later the result is abysmal. I went for FUT procedure I am not taking any meds used regaine before didn't see any benefit from it. My argument with him was that he met me in person and told me that 2000 grafts were enough when clearly they were no way near enough or I didn't get the 2000 grafts I thought I got how do you actually know you are taking their word for it. I understand this is a highly unregulated industry and there are horror stories out there mine is just one of disappointment and frustration wasted time and money. On the morning of the procedure he drew the new hairline I was quite nervous so I didn't say a whole lot as I felt I was in good hands. One thing that was off putting was that his assistants done the majority of the implanting I was heavily sedated obviously but still noticed that he would leave the room and come back every so often. Also I expected to be there longer we started about 10am finished by 3pm including 1 10min break 1 30 min break for lunch and a few toilet breaks. After years of struggling with hairloss I came across this forum. Going by the comments I went for Marwan Saifi in Poland. Fly over for a pre op and was assured this was the answer how wrong was I. After pre op went for the procedure night before was understandably quite stressed and was brought to the wrong hotel organised by Saifi what I found hilarious was when he asked me why I was at this hotel that his staff had organised. When I got home I questioned him about the procedure because it looked like he missed a lot I'm thinning not bald. I asked why he had not targeted all of the area and his response was people get hair greedy use hair max band and CR lab but he said give it time which I did. A year later waste of money plus he is not answering email. Buyer beware that is all I'm saying I went with him due to reviews on this forum didn't work for me. 1600 fue Dr Saifi, Poland. Having my first HT with Dr Saifi next month. I was over with him a few months ago for a consultation so only 5 weeks away now. Encouraging reading the posts on here. I'm opting for FUT and we have agreed 2000 grafts should be enough. I'm currently using the hair max laser band and CR lab range. One question I have hoping sonebody can advise. After the HT how long before you can out in public back to work without being totally obvious. I've decent enough coverage on top appreciate it varies on your recovery capability and othe factors. I've booked 2 weeks off work anyway so hoping that will be enough time. Cheers.